419 W. Irving Park Road conveniently located in Itasca in the Northwest and Western suburban areas of Chicago. Located just one block west of the Itasca train station on the Milwaukee District West line and kiddie corner from the Itasca police station. Come see us every month at the Itasca Coin Show located at the Itasca Holiday Inn. Itasca Coin and jewelry buys and sells coins. We buy and sell gold jewelry. We offer free verbal appraisals, written appraisals for insurance purposes, and jewelry repair services*. 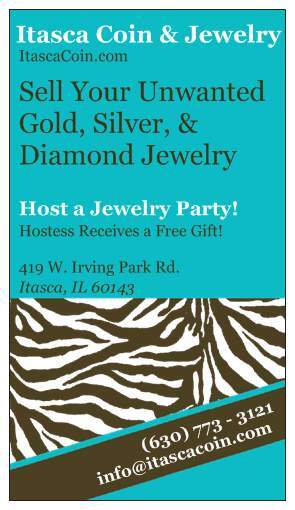 Join our mailing list(s) and be notified when Itasca Coin and Jewelry receives new inventory, special store promotions, and of all special events. Email informatiion is kept private and internal; any & all email addresses collected will not be sold to a third party. Silver bullion coins and sterling silver jewelry available for sale. Quantities are limited; please call for availability. We buy gold. Itasca Coin and jewelry buys unwanted, outdated, and broken jewelry. We buy gold, silver, platinum, and diamond jewelry. Soon we will be buying gold filled jewelry. 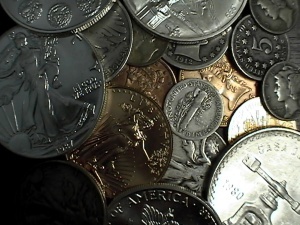 We will examine each coin / piece of jewelry and determine a value on your item(s). Let us make a competitive offer on your jewelry. Verbal appraisals are always free. There is never any pressure to sell. Prices are determined by commodity prices of precious metals, or by book value.